This is an awesome mug for your post-hike hot chocolate and a charming reminder of your time here at Mountain Goat Lodge. It's a signature mug by Deneen Pottery made by a master potter. Every piece is almost identical but individually crafted on a potter's wheel so no two are exactly alike! The mug holds 12 ounces and is microwave and dishwasher safe. We offer a special rate of $35 for two mugs. Shipping and handling is $5.00 per mug if you are unable to collect in person. Celebrating something while on vacation? Make the occasion all the more special by ordering this fabulous personalized package! It includes a scrumptious personalized cake and a bunch of balloons to get the party started. Because nothing says "celebration" like balloons and a slice or three of cake. And calories don't count on vacation, right? Just be sure to book this package 48 hours in advance. Kick-start your vacation with a touch of class and a chilled bottle of bubbly! If sparkling champagne is your thing, we can provide a bottle of Barefoot Bubbly (or a similar brand) in an ice bucket along with two glasses. Whether you're celebrating or just looking to relax with your favorite tipple treat, our champagne will hit the spot for sure. Surprise your sweetheart (or indulge your own sweet tooth) with a plate of lush chocolate-covered strawberries. The platter includes what can only be described as the Food of Love: one dozen fresh strawberries draped in Ghiradelli dark and white chocolate. Dreamy, divine, and oh-so-tempting! Why not purchase the chilled Champagne too (priced separately) for the ultimate in romantic experiences? These juicy strawberries are sure to get your mouth watering! Nothing says love and luxury like a dozen roses. We can supply a beautiful bouquet of fresh blooms, artfully arranged in a keepsake vase, and placed in your room upon arrival. Opt for red for that romantic vibe, or choose the recipient's favorite color; we will do everything we can to provide your chosen color of roses (or an alternative flower). Comes in keepsake vase! Please order 24 hours in advance. Step into your room and be greeted by a colorful, mouthwatering array of fresh fruit and a whole host of other goodies! You'll discover a rustic wicker basket bursting with foodie treats, including seasonal fruits, scrumptious crackers and cheese, tempting candies, and two keepsake Mountain Goat Lodge mugs crammed with chocolate truffles. With all this lip-smacking food on offer, you won't want to leave your room!48 hrs notice required. Enjoy a therapeutic massage to either prepare you for a day of mountain-hiking or help ease your aching muscles afterward! You'll be treated to a relaxing one-hour massage in the comfort and privacy of your own room. Our licensed and bonded professional masseuse comes to you so you can completely unwind. This is a pampering treat for you or for your travel buddy! Please be sure to reserve your massage 48 hours in advance. An essential piece of kit for trekking, hiking, camping, emergencies, and day-to-day activities! This is a well-made, bright, reliable LED flashlight to help intrepid explorers navigate the mountains in the dark. Batteries are included for your convenience so you can just grab your backpack and head out into the wilderness! Don't hit the great outdoors without this trusty flashlight. You'll get lost in the pages of this book, but thanks to its detailed information, you won't get lost in the mountains! "The Local's Adventure Guide to Mellow Mountain Trails: 27 Fun Day Hikes in Salida and Buena Vista/Hiking Guide to Colorado's Upper Arkansas River Valley"... Our local trail guide is a must-have for details of hikes in and around Salida, Nathrop, and Buena Vista, CO. Don't hit the trails without this comprehensive and practical guidebook! Celebrating an engagement, anniversary, or birthday during your vacation? Or maybe you're hoping to pop the question while you're here? Our romance package is everything you need to create a look of love. It's a wicker basket brimming with treats sent straight from the heart, including candies, seasonal fruits, cheese and crackers, and two keepsake Mountain Goat Lodge mugs filled with chocolate truffles. You'll also receive a chilled ice bucket with a bottle of Champagne and a dozen roses in a keepsake vase. SIGNATURE MUGS by Deneen Pottery - While every piece is almost identical, each one is individually created on a potter’s wheel by a master potter. No two are exactly alike! holds 12 ounces. Safe for microwave, and dishwasher. SPECIAL two for $35. We will add $5.00 per mug for shipping and handling (If not able to pick up in person). This is a complete guide to the ski and snowshoe routes in Colorado's Upper Arkansas Valley, including Leadville, Tennessee Pass, Twin Lakes, Buena Vista, and more. This handy book includes 25 of the best winter snow trails for beginners and experts, skate skiing, backcountry adventures, plus an additional 35 trail options. Each route includes a mile-by-mile description, map, and other vital information. Also included is advice on where to eat, sleep, and soak in hot springs. 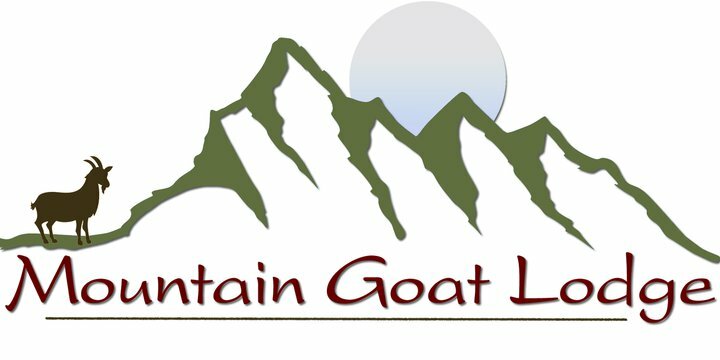 We make all-natural goat's milk soap using the milk provided by our Lodge's namesake goats. The beautiful blends will leave your skin feeling soft and smooth while giving you a lush shower time treat! The soap bars are carved with rustic images, making them cute keepsakes and vacation souvenirs, or charming gifts for a natural beauty lover. We craft other kinds of soap too, all priced at $10 per 4-ounce bar. Soft and super-comfortable, our tees are a wearable way to show your love for the Lodge! They're well-made and feature a screen-printed image of a proud mountain goat (what else?) and our logo. These tees are surely the ideal apparel for your outdoor adventures and a great way to remember the fun you had with us. Sizes: Mens Womens and Childrens sized small-to extra large, various colors.